What do you do for the holidays when you’re a small town museum and you’re in the middle of transferring your whole collection from the lower level of a historic Town Hall into a space a couple of blocks away? If you’re the Elk Rapids Area Historical Society you have a month-long party and invite the neighbors in. 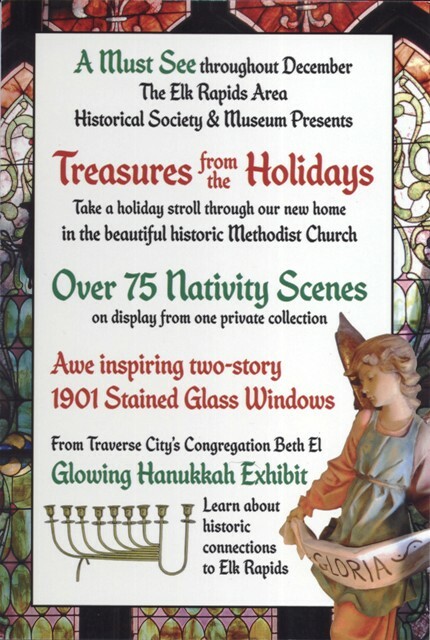 Beginning on Friday, December 2, the Society will present “Treasures from the Holidays,” its first major exhibit in its new home at 301 Traverse Street. The 110-year-old former Methodist Church with its two-story stained glass windows will overflow with good will. Michigan collectors Peg May (May’s Yesterdays) and Michael Whalen (president of the North American chapter of the Friends of the Creche Society) lent Nativity scenes from around the world. There are classic figures from the Fontanini studios in Italy, a retablo by New Mexico artist Charles Carillo, and an icon from Spain. There are whimsical figures from the dimestore, hand-carved olivewood palm trees from Bethlehem and ebony carvings from Kenya. There are porcelain music boxes and crystal ornaments and wooden puzzles. More Nativity scenes, probably, than you’ve ever seen in one place in your whole life. But there will be more. Congregation Beth El in Traverse City created a Hanukkah display with cherished family menorahs and photos of the founders, some of whom were pioneer settlers in Elk Rapids in the 1870s and 1880s. The synagogue they helped to build in 1885 is recognized as the oldest synagogue building in continuous use in Michigan. Regional artists are participating, too, with a watercolor by Joani Braun, a bronze Dancing Rabbis menorah cast in Scott Nelles’s studio in Elk Rapids and a print by Glenn Wolff. Volunteers have been unpacking the treasures for weeks. Improvise. A manger filled with straw makes a fine bed for a baby. A cherry lug draped with sparkly fabric becomes an elegant pedestal for a porcelain music box. Mary arrived in Elk Rapids strapped in the back seat of a minivan. Where better to go to all that trouble than in a building full of stained glass windows and history? This is going to be fun. Dec. 2-4; Dec. 9-11; Dec. 16-18. Fri. & Sat. 11am-4pm, Sun. 1-4pm. Please enter your email address to receive notices of new posts. Camping out on Verdant Ground, with presents! iNaturalist ... YOU naturalist ?